Hoffman’s Sew Into It! 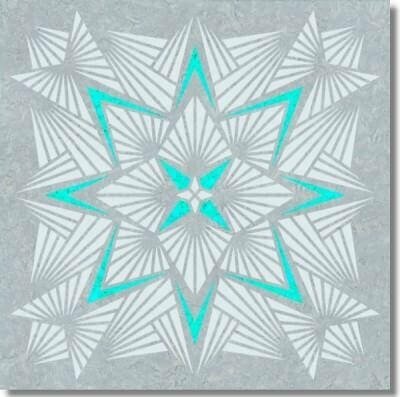 kit features the Crystal Clear kaleidoscope star project that finishes as a 90" square quilt (queen size). The project is designed by Jeanie Sumrall-Ajero, founder of Kaleidoscope Kreator software, using Hoffman Bali Watercolors (Style #1895) hand-dyes. Fabrics have been cut with a laser-guided machine. All the cutting work is done, leaving the fun part for you — no templates, no paper, no math, no Y seams, no cut-off points and no guesswork. A quilter with basic techniques will be able to master this stunning project. The color way is rich pinks and green. The kit includes the pattern and fabrics needed for the project. You will need an additional 8 1/4 yards of backing fabric.